The camera announcements are starting to spread like wildfire as the NAB convention in Las Vegas approaches. Yesterday we heard about Sony’s new FS700 camera which improves on their already-popular FS100 indie film camera. 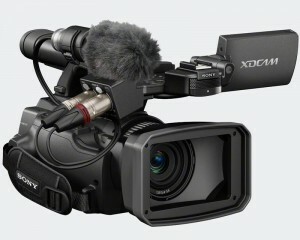 Late last night, news from Sony on their new mini XDCAM PMW100 hit their Facebook page. This is a really exciting journalist’s camera. UPDATE: Got to see this camera at the Sony booth at NAB. It’s much larger than it looks in the handout photos and is quite wide, so even though its smaller than an EX1, the packed for travel size is going to be about the same. Quite a bit bigger than a Canon XF100. However, it is lighter than an EX1 and easier to hand-hold. This is a direct competitor to the JVC HM150 and Canon XF105 cameras. Supposed to be available in May at a list price of $4500. 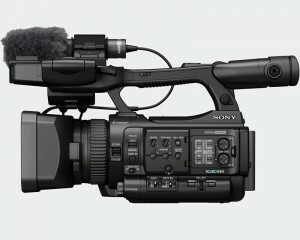 “PARK RIDGE, N.J., April 3, 2012 — Sony is introducing the full-featured yet light and compact PMW-100 handheld camcorder. The new PMW-100 joins Sony’s XDCAM HD422 line-up as the smallest and lightest camera in the XDCAM family. The PMW-100 combines exceptional picture fidelity with portability and outstanding manoeuvrability based on the proven XDCAM workflow, giving professional users a new level of productivity. The development of the PMW-100 is a natural step in the progression of the XDCAM line, and its development is in direct response to customer feedback for a light and compact camera that will not only perform well on its own, but also alongside other XDCAM cameras such as Sony’s PMW-500. 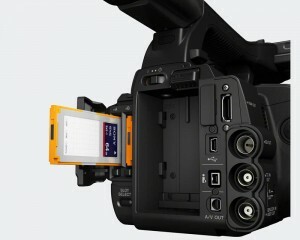 The PMW-100 XDCAM camcorder is planned to be available in May, with a suggested list price of $4,500.